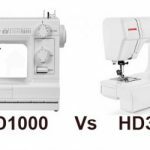 The ultimate list of best embroidery machines available in U.S under $600. Poor low quality machines are omitted from this list. Choosing an embroidery machine is never an easy task. 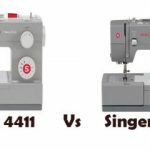 In this list of best embroidery machines, we are confining our results to embroidery machines that cost under $600. That is the price range where most people look for. We always have a budget, don’t we? We will always look for a machine that falls under our budget, without compromising too much on quality and performance. As far as we are concerned, quality comes first and price next. 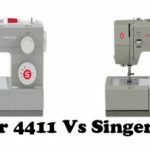 So we have omitted some poor quality embroidery machines that doesn’t satisfy the quality standards we have set for ourselves at Sewing Machine Reviews. There are a lot of things you must consider before buying an embroidery machine. You must know your requirements very well. Embroidery area is one important factor. Different machines come with different embroidery area, you must choose the one according to your requirements. If you want more creativity in designs, you will be better of going with embroidery machine that has a USB connectivity to import designs from the internet. 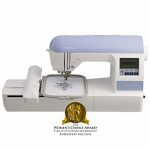 Now let us go through the list of ‘Best Embroidery Machines In U.S Under $600’. This is an embroidery only machine. The highlight of this embroidery machine is the large embroidery area of 5″ x 5″. 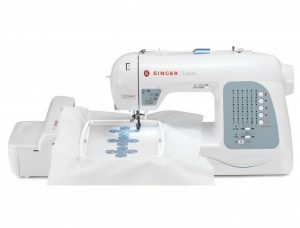 This machine comes with 73 built-in embroidery designs and 3 monogramming fonts. It is a good embroidery machine for beginners. 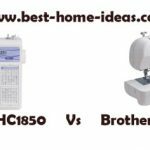 When you consider the price and features in combination, this turns out to be the most affordable embroidery machine in this list. Pros : For the price, you can’t find a better machine with 5 x 5 inches embroidery area. So it would be a good choice for those who have a tight budget, but still want a large embroidery area. It has USB connectivity to import designs and you can store up to 100 designs in the memory. It is a user-friendly machine. The build quality is quite good as well. 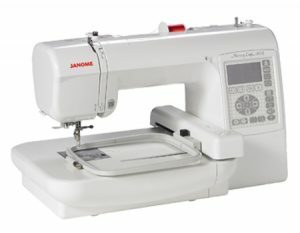 Janome has limited the use of plastic and wherever they used plastic, they made sure that it is of high quality. Cons : Occasional stitch skipping is observed. XL-400 is the second most expensive embroidery machine in this list. 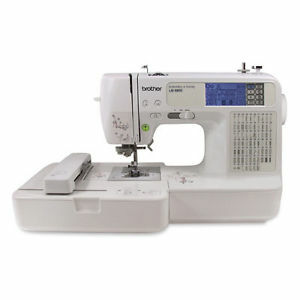 It has both sewing and embroidery capability. So you can use it as a normal sewing machine as well. It has 125 built-in embroidery designs and 30 sewing stitches. It comes with 2 embroidery hoops of sizes 10” x 6” and 4” x 4”. Pros : XL-400 is feature rich, which is the main selling point of this machine. Even though you may consider it as expensive, it still has some nice features that justifies its price. It has USB connectivity. Cons : The machine is slightly on the louder side. It doesn’t have an automatic thread cutter. For the price, Singer should have included that. 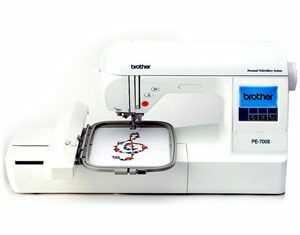 Brother PE700II is an embroidery only machine. It has an embroidery area of 5″ x 7″. It has 136 built-in embroidery designs and 6 built-in lettering fonts. There is an interesting thing about this machine. 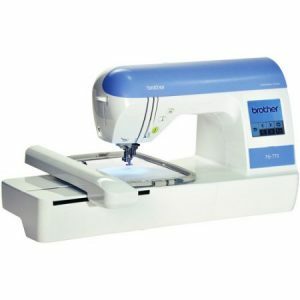 This machine is the same as Brother PE770, which is the second best embroidery machine in this list. The difference is just in the price (minimal) and type of USB port each machine has.. The reason why this machine is so far down in this list is because people choose the other model over this one because of the better USB port that supports USB sticks or thumb drives. Pros : It an easy to use machine. It is one of the easiest machines to thread. It has a large embroidery area. Cons : You will have to tweak the tension, the factory preset tension is not right. This will be an excellent choice for those who are on a budget. It has an embroidery area of 4″ x 4″. It comes with 70 built-in embroidery designs. Even though it is inexpensive, it doesn’t reflect on its quality and performance. Pros : It is a portable and easy to use machine. It has USB connectivity. You can store up to 12 designs on the machine memory. It is highly rated by its users. You can describe PE500 as ‘A sturdy workhorse for a reasonable price’. Cons : The embroidery area is not large enough for full time professionals dealing with large projects. You can term this as a flawless machine. The funny thing is that it the same as the best embroidery machine in this list except for the rolling tote bag. I always wonder why Brother sells the same machine under different model names by just adding one or two extra features or accessories. You have already seen one such machine in this list, now this is the second one. LB6800PRW has both sewing and embroidery functions. It has 70 built-in embroidery stitches and 67 built-in sewing stitches. You can go with this machine, if a rolling bag and Project Runway branding is important to you. Pros : Easy to use. It is a frustration free machine. It has USB connectivity. Cons : It is the same as Brother SE400 but priced higher for a bag. PE770 is the best ’embroidery only’ machine. It is a machine designed for professionals. It is also the most expensive embroidery machine. This is the machine with the largest embroidery area in this list. It has a maximum embroidery area of 5″ x 7″. It comes with 136 built-in embroidery designs and 10 built-in frame designs. PE770 loses out to SE400 only in terms of affordability, otherwise this would have been on top. Even then, you will never get the features of PE770 on an SE400. The freedom of larger embroidery area is vital for professionals. This machine has also won the Consumers Digest Best Buy Award. 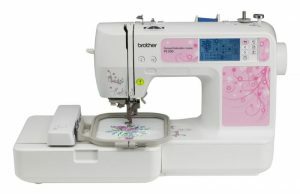 Pros : If you ask me which is best embroidery machine for professionals, my answer will always be Brother PE770. It has so many features that you normally won’t get on other machines. It has USB connectivity as well. The quality of embroidery is of the highest class. Cons : Expensive, nothing else. 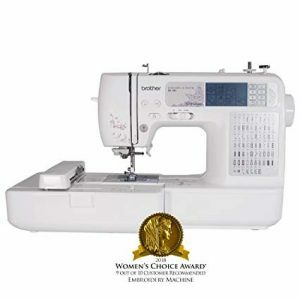 One of the best machine ever reviewed by Sewing Machine Reviews. It is a stunning machine. This machine sews like a dream. You will never get a 100% perfect machine, but SE400 is as close you can get in terms of perfection. That is the reason why it features in our list of ‘Machines You Can Buy With Your Eyes Shut’. It has both sewing and embroidery capability, probably its biggest advantage. It has 70 built-in embroidery stitches and 67 built-in sewing stitches. The maximum embroidery area is 4″ x 4″. Pros : An absolute wonder machine. It is affordable as well. Cons : Not much, the embroidery area could be larger. This concludes the list of ‘Best Embroidery Machines In U.S Under $600’. My final recommendations will be SE400 for a beginner and PE770 for a professional. These two are the best of the best.